One of the most daunting corners in British motorsport and the first challenge on your lap. You will cross the start/finish line towards the right hand side of the track and angle yourself slightly left as you climb the hill leading to the top of Paddock Hill. The track falls from left to right all the way along the start straight so keeping the car to the right along the straight means you will have less of a hill to climb coming out of the last corner at Clark Curve and will therefore be travelling faster. The start straight also gently arcs to the right along its whole length as well. The sharp ascent as you move to the left helps to stabilise your car ready for your braking. The braking is done over the gentle crest of the hill, you will not be able to see the corner or the apex before you brake so you will need to run the corner a couple of times to get the trajectory in your mind so that you can judge the braking point accurately. Whilst braking try to keep the car as straight as possible but with the track falling away to your right and also gently arcing to the right you will not be able to be perfectly straight. Also be aware of a couple of bumps in the braking zone which will do their best to destabilise the car. Aim for the green and white striped board on the tyre wall and your turn in point will be as you get to the edge of the track whilst travelling in this direction. By the time you turn in you will be already dropping down the hill so you will need to be mostly clear of the brake at the turn in point and don’t pick up too much balancing throttle too early as this can unsettle the car. The apex is just at the point where the hill is at it’s steepest but stay off of the apex kerb as it is quite high and can easily get you into trouble whilst giving you no benefit in the angle of attack on the corner. By the time you have reached the apex you should be hard on the throttle. It’s always a bit of a leap of faith this one as you seem to need to get on the power before the car has fully settled and when your instincts are telling you that the steep descent will make you wash out wide and off of the track. What you are relying on is the exit of the bend coinciding with the valley bottom between Paddock Hill and Hailwood Hill. The car will compress dramatically here giving you a large helping of grip just when you are about to run off of the track. This means you can keep your momentum you gained by getting on the throttle early mid corner and carry the speed up Hailwood. The exit of this corner is always a point of conflict between the competitor and MSV. The edge of the track here is marked with a mild rumble strip but has the tarmac of the pre 1976 alignment of the corner outside this strip with the gravel trap placed directly onto the old tarmac. The fastest line here is to get all four wheels over the rumble strip and onto the old track but MSV would rather you didn’t. In recent times the gravel trap has seemingly moved a little closer to the circuit but it is still possible to get at least 2 wheels over the rumble strip. There are limits often imposed on how often you are allowed (?!?) to do this in a race so make sure you don’t fall foul of the rules. After exiting Paddock Hill Bend you will be on the left of the circuit climbing Hailwood Hill towards Druids. Initiate your braking on the left but immediately start to bring the car into an early apex. Be careful with your braking here as there is a slight crest in the road just under the bridge which can lighten your wheels momentarily, causing them to lock up. Get alongside the apex kerbing early and follow it around the corner using the gentle banking effect of the hill to help you. Avoid running up onto the kerb as it has large ‘cow pat’ ridges which will throw you off line. Try to get the power on smoothly and from the middle of the corner, your speed trace should look close to a mirror image with you braking and reducing speed all the way up to the mid point of the bend before accelerating away from this mid point. Let the car run out to the left hand edge on the exit. A shadow of it’s former self, this corner was re-profiled in 1998 and is now a messy, fiddly left hander which rather spoils the flow of the circuit. Most people make the mistake of rushing over to the right hand side of the circuit as soon as they have exited Druids and following the edge of the track to the turn in point. 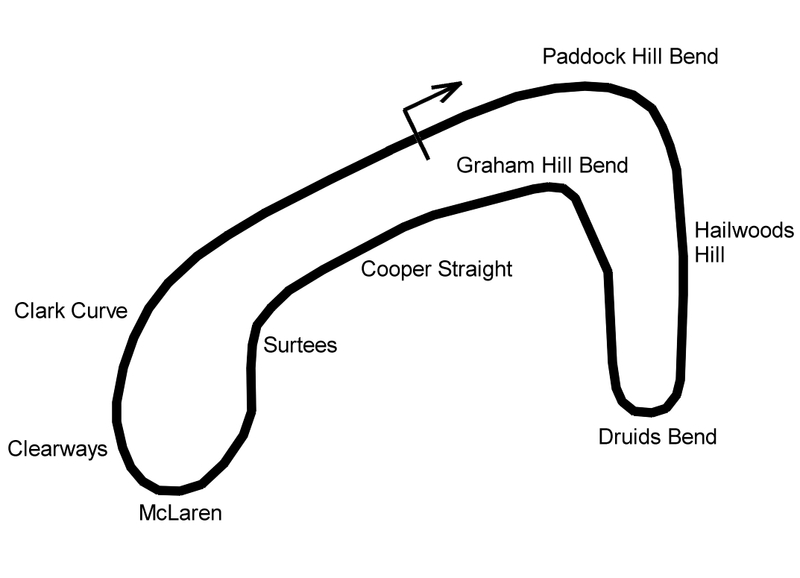 Due to the shape of the track, a slight left kink before the bend, and the descent down the hill this action tends to create instability in the car in the braking zone. A better line is to aim the car half way between the ‘50’ board and the turn in point and as you approach the edge of the track here start to turn the car to come alongside the track edge, this takes you up to the turn in point where you can continue to turn in the wheel to bring the car into the corner. This line means you will initiate the braking with the car still in a straight line so you will be more stable up to the turn in point. You will be braking down hill here to bear in mind the extra momentum you will have as you can very easily run a touch wide of the apex. The apex is at the foot of the hill so you can turn in on the brake to help the direction change without getting the car out of shape. The following straight is reasonably long so you want to be on the power as hard and as soon as possible and shallow out your exit line. Use a little apex kerb and a little exit kerb but be warned that these kerbs increase their height dramatically the further from the track you get and are high and sharp enough to cause damage to the underside of your car if it is low. This extra height will also unsettle your car so for the best lap times don’t get too greedy. MSV are also particularly sensitive about drivers repeatedly running over the kerbs and onto the grass here so check of any penalties that may apply before you go on track. I’ve included these two corners together as the first has such a direct impact on the second, by which I mean that if you get the first one right the second is takes care of itself. As the track kinks left along the Cooper Straight you will be hugging the white line on the right. The proximity of the barrier on the left means the approach to the corner is fairly blind and you won’t see the exit until you are at the apex. Your turn in needs to be fairly early and fast. A lot of vehicles can turn in here flat or with just a little lift. Use as much of the kerb on the left as you possibly can (though be aware there is a dip or shallow point right in the middle of the kerb so try to go one side or the other of this point). If you’ve used enough kerb at the left of Surtees then the right at McLaren should then be almost straight, use the full track width over the white line on the right but not the rough kerb. You are gently climbing again now so aim towards the outside of the track ready for the turn into Clearways and Clark Curve. Braking up hill as you leave the apex of McLaren and traversing the track in a straight line towards the left hand side try to get about a cars width from the left before turning in. At the turn in point the ascent plateaus so gently ease the brake into the turn, it’s easy to out-brake yourself in the last few feet. The first apex is at the point where the Indy track and the Grand Prix loop meet. There is a fairly flat kerb on the inside which has it’s shape disguised by a smooth arc of paint on the tarmac. The point where this painted tarmac becomes kerb is where you want to aim your right front wheel. Get on the power smoothly here as the moment you want to be accelerating the track falls away from you down hill which will make you run out wide. You should aim to get to the left of the track just before the white line which runs across the circuit delineating the restart line for pace car conditions. This line traverses the track and the pit entrance and is at the bottom of the hill, keep the wheel turned in and the power applied and as the track straightens out come into your second apex which is just past the marshals post on the right where there is a small section of tarmac to the right of the white line. Keep hugging the pit wall all the way to the start line as this is the shortest route and the bottom of the hill so less work for your engine to do.